England with The Little White Dog – say what! Last Friday, Mr G, The Teen and The Wee White Dug met me at the office at 3:30pm. I couldn’t have exited the building any faster if I was being pursued by a lion! We were off to the Scottish Borders for a self-catering break near Coldingham on the Berwickshire coast. An hour later we arrived at our cottage on Press Mains Farm. It had a perfect outlook across open countryside. Deer grazing in the fields nearby acknowledged our arrival by fleeing. We were greeted more warmly by a whirling dervish called Doug. Doug was an adorable, scruffy terrier – the boy loved him. Mini-breaking so close to home meant we arrived with daylight to spare, so we quickly unpacked and headed to the beach at Coldingham Bay. The beach sits in a deep bay, on coastline dominated by rugged cliffs. A maze of narrow paths wind along the shoreline, and tales of Smugglers are rife. Colourful beach huts stand on the edge of the sand. As we were admiring them I spotted a giant black rabbit hopping about in the undergrowth. Mr G and The Teen saw it too so I wasn’t going mad. It seems in Coldingham, pet rabbits are given the freedom that is normally only reserved for domestic cats. We spent a lovely night back at our cottage, feasting on buffet foods. I lit the fire, and was proud as punch of my fire lighting skills. Shunning the traditional role of hunter gatherer Mr G showed no interest in setting fire to logs. The Teen was too engrossed in the free WiFi to care. Next morning we were up and out early, but not before enjoying a hearty cooked breakfast first. We heard gun shots, causing the wee dug to responded with a volley of his own. Ears ringing from barking and bullets we jumped into the car and were England bound. That’s right – we were England bound. The lure of Flodden Battlefield, a mere 40 minutes away was too much of a temptation for me to resist. The Battle of Flodden took place at Branxton in Northumberland on 9 September 1513. The Scots suffered a devastating defeat, losing their king – King James IV, together with a large number of their nobility and an estimated 10,000 – 17,000 soldiers. The English suffered in the region of 1,500 losses. It’s difficult to know exactly how many died as estimates vary, and post battle propaganda would have exaggerated numbers on both sides. I found the on-site interpretation of the battle respectful and sympathetic given that it was a big English victory. An air of sadness hangs over the place, even today. We visited the village church which stood as the battle unfolded 500 years ago. It later doubled as a makeshift mortuary as the awful task of clearing the battlefield began. There were beautiful old tombstones in the churchyard, and I was drawn to a sad-looking cherub. It was as if he knew what once happened in the lush, green field standing, silent and still behind him. After a sombre, but fascinating visit to Branxton we drove to the quintessentially English village of Etal. It’s a tiny village with a cluster of thatched cottages and a pub called The Black Bull. The dramatic ruins of Etal Castle stand on the village green. In 1513 the Scots captured the castle en-route to Flodden. After visiting Etal it was time to leave beautiful Northumberland and head back towards Scotland. It’s compulsory for Scots to stop at the Border and make a fuss over the Welcome to Scotland sign. We duly complied and set the wee dug up for a photo. Patriotic Scot duties over, it was time for lunch. The busy harbour town of Eyemouth felt like our best option for finding a dog and under 18 friendly place to eat. We parked near the harbour and walked into town, passing the impressive Gunsgreen House, which was built-in 1753 by local smuggler John Nisbet. Inside, the house has secret nooks and crannies built into the architecture for hiding smuggled goods. We enjoyed lunch at the dug friendly Ship Restaurant. For dessert we popped into Giacopazzi’s next door. Their ice-cream and sorbet is made fresh on the premises. The first World dilemma of choosing a flavour was a struggle but finally I opted for Creme Egg, Mr G mint choc-chip and The Teen Oreo. The ice-cream was delicious and rendered us silent as we tucked into our cones on the way back to the car. To walk off our calorie laden lunch we decided to visit St Abb’s Head National Nature Reserve to spend a couple of hours hiking. I say we, but The Teen wasn’t exactly enthused at the prospect of a hike. Her mood changed when we met some horses not long into walk. She’s a sucker for animals and 5 minutes of horse whispering later she was in a fine mood. St Abb’s Head is one of Scotland’s most beautiful walks and is a favourite of mine, although the start turns me into a controlling, seething lunatic. It follows a narrow path along the edge of a cliff. With no head for heights I start barking orders to keep away from the edge! After a while Mr G’s usually had enough and shouts “I’m a grown man with a responsible job – stop bossing me around”. The boy doesn’t get off lightly either. He’s huckled along on a lead some might call unnecessarily tight! Normally we’ve all fallen out by the time we reach ground that I deem to be safe! 40 minutes walking later, we reached St Abb’s Lighthouse. The lighthouse was built-in 1862 by lighthouse engineers David and Thomas Stevenson – uncle and father of author Robert Louis Stevenson. Below the lighthouse a bright red foghorn clings to the cliff edge. Growing up on the Firth of Forth with its frequent sea haar, the foghorn was a sound I heard often as a child. I loved it – it always made me feel cosy and safe at home. It had gone from being a grey, gloomy morning to a pleasant afternoon. Newborn lambs were frolicking in the fields and the cheery yellow gorse was in full bloom. It filled the air with the summery scent of coconut – it was a perfect. Mr G, keen to get back for the kick-off of Scotland’s Six Nations Rugby match against the Auld Enemy began to increase his pace. I cursed him under my breath as we sprinted round our lovely walk to sit indoors and watch tv. As we sped past a sign announcing ‘SLOW walkers & animals’ the irony wasn’t lost on me. I saw Mr G power off into the distance with The Teen and Wee Dug in hot pursuit. Later when Scotland were hammered by England at Twickenham I felt vindicated. We spent a second night relaxing back at our cosy farm cottage. I took full advantage of the huge jacuzzi bath to unwind with some Arran Aromatics bubbles after my sprint round St Abb’s Head. Next morning we woke to blue sky so decided to enjoy a leisurely drive home. Coldingham Priory was our first stop. It has a long and rich history, and was once a hugely significant religious site. It was founded after King Edgar granted the land in 1098 for the founding of a Benedictine order. The priory has been through many iterations in its near 1,000 year history, and has risen like a phoenix from the ashes after numerous attacks. Today the medieval ruins sit alongside the modern-day church which is still in use. As we explored the ruins the sound of hymns rang out around the churchyard. Once we’d explored the priory we wound our way northwards stopping at Cove so the boy could enjoy some fast running on the beach. In 1881 a terrible storm at sea caused heartache for the small fishing communities dotted along this coastline. 189 men died and the tiny village of Cove lost 11 of its 21 fishermen, and 3 of its 5 fishing boats. Today poignant memorials stand in the towns and villages left devastated by the tragedy. They pay tribute to the women and children left behind. The women stand looking out to sea, both hopeful and grief-stricken as crying children cling to them for comfort. The beach at Cove is sheltered by a small harbour and visiting it is a real adventure. A path winds down to the shore and soon reaches an ominous looking tunnel which disappears into a wall of natural sandstone. The 18th century tunnel cuts through the rock to access the beach. It was once used by Fishermen for storing fish. It’s rumoured to have been used by smugglers too and stumbling, cautiously through it, it’s easy to imagine illicit goings on. Visiting the beach and harbour at Cove is like stepping back in time. It’s completely unspoiled, and is one of Scotland’s finest hidden gems. Two tiny Fishermen’s cottages sit on the harbour wall. On the beach is a sea cave which can be explored at low-tide. Inside generations of visitors have etched their names into the soft, sandstone walls. I found one carved days after I was born. The boy had an absolute ball exploring the sea cave, checking out the rock pools and running on the sand. He even let his hair down and had a paddle in the shallow harbour waters. And there ended another wonderful weekend, spent exploring in the lovely Scottish Borders and beyond. Spring was springing – the gorse was blooming, the trees were budding and the days were getting longer. I felt a rush of excitement as I thought of the long summer days, the wide open spaces and the remote corners of Scotland that were waiting for me to explore them this year – happy days. Next time you cross the border, come and visit Berwick-upon-Tweed. We have a fabulous sandy dog friendly beach at Spittal. I walk my two Westies there every day. Plenty of dog friendly eateries too. PS. I go to that ice cream shop in Eyemouth. The last time I was there I had tablet ice cream…. for all of 5 mins, till a seagull decided I wasn’t to have it!! Grrr. Lol. The little I had was lush!! The other best tablet ice cream is from a wee cafe in Helensburgh, another lovely dog walking place!! Oh my goodness, you must completely fast between all those delicious meals and treats! yeah, my family is pretty disgusted with my demands when it comes to heights – when the children were young, they had to step back as i barked at them, as they got older, they were amused at my frantic attempts to control them, and now in their 20s, they smile and acquiese out of kindness to their poor momma. Battlegrounds are always on our visit list – they are such sad and reflective places – so much horrible loss of sons and husbands. I cannot image how mums survive the trauma and loss. Ha ha hiking between treats helps burn off calories. Luckily I don’t have much of a sweet tooth so it’s rare for me to eat ice-cream and desserts. Glad I’m not the only neurotic clifftop screamer. 😂 it’s hard to imagine the devastation of 17,000 dead people all lying in one field. I always wonder where they end up buried too. Hidden away somewhere and forgotten about. We never got our king back to bury either. Never went to Flodden where “The Flowers o’ the forest are a’ wede away” Mainly the border Abbeys and Sweetheart Abbey. I really don’t think I would have coped well at Flodden. However, loved the post and I’m so glad the Teen found animals that she could respond to. Lovely photographs. I did a feature on the Priory some years ago so I was glad to see that included in your travels. 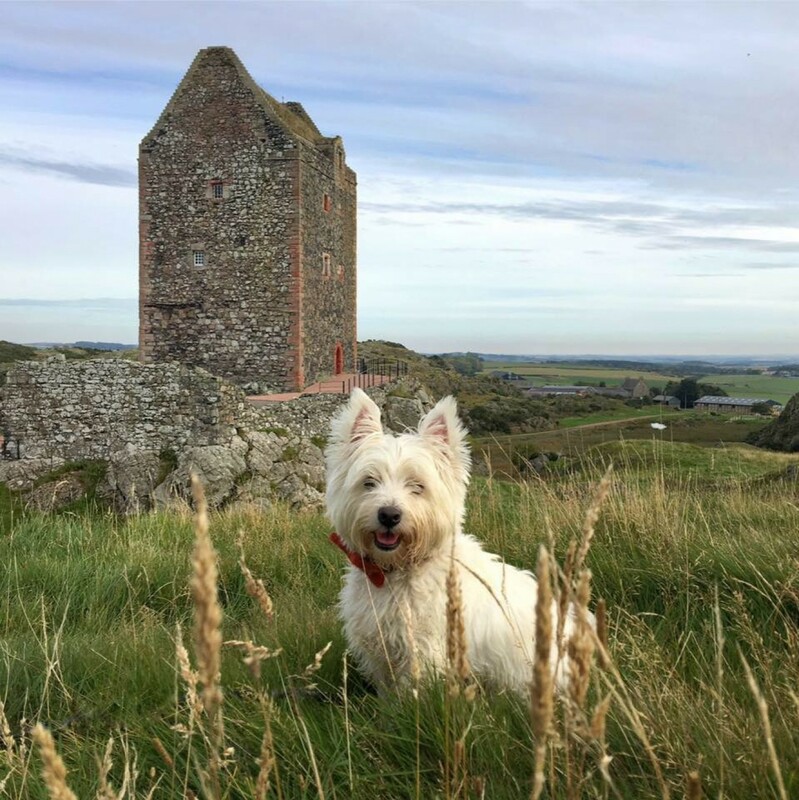 I so enjoy your posts and the adventures of the Wee White Dug. Would love to do something similar here but about an hour drive west and I would reach the small fishing port of – which, by the way, contains about 85% of the world’s known Jade deposits. From here to there, it’s just open and empty land. Flodden was sad but beautiful too. Treated very sympathetically. Given that it was a huge English victory I think that says a lot. Coldingham is lovely and the Priory fascinating. Because I’ve always lived by the sea it’s in my blood. I need to be near it or water. Think that’s why I love the islands so much. Ciao Sam, this was an extraordinary post I loved each words and each photos, I will go and check for more informations. Thank you again for sharing 💚💚💚 N.
Thankyou so much! So enjoyed the read and the photographs. Kind of you to let us ‘join’ you on your travels. Looking forward to more installments to come. Thank you for reading. All are welcome on our travels. Lots more adventures to come. Wow! The Wee White Dug is a hit wherever he goes! And your photos are just sensational, Samantha. Thank you for inviting readers to travel with you. Thanks for your example of making life a joyful journey – everywhere you go! Thank you so much. We love sharing our travels and beautiful country. Wow, that was very cool and beyond interestingly! That is something I can only dream of doing but would love to. You are very fortunate. Being a Scotsman, it was pretty moving to see all those locals. Thanks for sharing, I’ll be watching that over and over! Thank you, glad you enjoyed. So many nice little places in that part of the country. I am looking forward to more adventures of the Wee white Dug in the future. The photos are amazing and make our trip to the Isles from Canada in May something to really look for. Thank you – you’ll have a wonderful trip. The Scottish Islands are stunning and May is often a lovely month. Beautiful. The Borders is the one part of Scotland I’ve barely explored. Driven through it enough but never strayed off the motorway. Some good spots for a future trip to the Homeland. Oh absolutely – always nice to add places to the list. The Borders were a favourite day trip when I was a child. I love the Berwickshire coast as it’s often overlooked for the more popular abbey towns like Melrose.